That’s the question Pender EMS Training Chief David Dudding, Pender County Sheriff’s Office Capt. James Rowell and Sgt. Eric Wallen asked staff and students at Pender Early College High School during ALICE Training on Friday, April 13. Only a few hands raised. 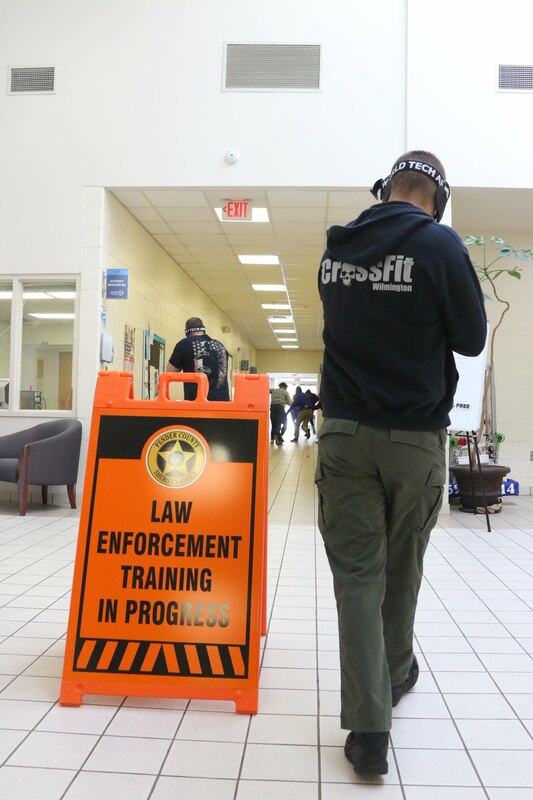 ALICE -- which stands for Alert, Lockdown, Inform, Counter, Evacuate -- is a training program that equips people with skills to increase their chances of survival during an active shooter situation. For training purposes, Capt. Rowell, Dudding and Wallen played the role of “ active shooter.” Students and staff learned about and practiced several responses to the simulated attack, including working together to barricade the classroom entrance with tables and chairs; throwing foam balls at the active shooter to disorient him; swarming the shooter and grabbing hold of his arms and legs, disarming and immobilizing him; and evacuating the building safely. "We appreciate members of the Pender County Emergency Response Team, especially Capt. Rowell, Sgt. Wallen and Chief Dudding, for taking time today to train PECHS staff and some students on the ALICE principles," Pender Early College Principal Kevin Taylor said. "It was a wonderful and powerful experience. While we are in the business of educating young men and women for the world that awaits them, we also understand that our parents trust us every day with their most precious possession -- their child. ALICE is another tool we can use to make our school safer." At the end of the training, Capt. Rowell asked students and staff the same question they were asked when they arrived. Nearly every hand raised. "Instead of being scared about what could happen, we now feel empowered and prepared," said Karli Mikula, PECHS teacher. Pender County Schools is piloting ALICE at Pender Early College High School. In a review of school safety procedures, the district’s Safety Committee, comprised of representatives from the school system, local law enforcement, Pender County Fire Marshall, Pender EMS and Fire, and Coastal Horizons, is identifying areas where the district can increase safety at all schools. The Safety Committee is conducting safety walkthroughs at each school campus and has also completed active shooter training with school staff.